Israeli airstrikes reduced entire apartment buildings to rubble and knocked out electricity in swaths of the Lebanese capital Sunday, and Israel dramatically escalated the ferocity of its campaign after Hezbollah rockets hit the northern city of Haifa. Eight people were killed in Haifa when Hezbollah rockets smashed into the city train station in retaliation for Israel's overnight barrage on the capital. Soon after, Israeli warplanes bombarded the guerrilla group's headquarters in south Beirut again with a barrage of missiles, sending palls of smoke over the crowded residential area. The toll continued to rise: Police said 130 people, almost all civilians, have died in Lebanon in the five-day Israeli onslaught. In Israel, 23 have died, including 15 civilians killed by rocket fire. Lebanon's government said Italy has relayed Israeli conditions to stop the offensive: the release of captured Israeli soldiers and Hezbollah's withdrawal from near the Israeli border. Meanwhile, the Israeli military said it recovered the bodies of the three sailors missing since their ship was attacked off the coast of Lebanon Friday by a Hezbollah missile. The body of a fourth sailor was recovered in the wreckage Saturday. Beirut, a city of 1.5 million people, was emptying as residents fled to the relative safety of the mountains and the eastern Bekaa Valley - though in the past 24 hours Israel expanded its strikes to the entire country. Both sides warned of worse to come in the battle, sparked by Hezbollah's snatching of two Israeli soldiers last week. Fears mounted that the fight could expand as Israel accused Iran and Syria - top Hezbollah backers - of supplying the guerrillas with sophisticated new missiles that hit Haifa. 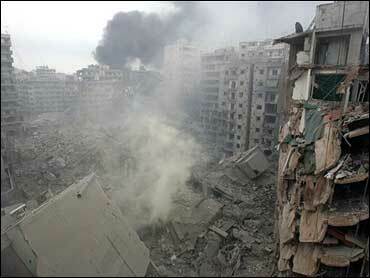 The Syrian government warned of an "unlimited" response if Israel attacks it. "Any aggression against Syria will be met with a firm and direct response whose timing and methods are unlimited," Information Minister Mohsen Bilal said. And Hezbollah denied it received Iranian help and Tehran said it had no role in the fighting, disputing Israeli claims that 100 Iranian soldiers had helped Hezbollah attack the Israeli warship. Iran's President Mahmoud Ahmadinejad condemned the Israeli offensive, accusing Israel of "behaving like Hitler." Israeli Prime Minister Ehud Olmert said Sunday that there would be "far-reaching consequences" for the rocket attack on Haifa. "Nothing will deter us," he said at the beginning of his government's weekly Cabinet meeting. "There will be far-reaching consequences in our relations on the northern border and in the area in general." The head of Israel's northern command, Maj. Gen. Udi Adam, warned residents of southern Lebanon to evacuate "because in two or three hours we are going to attack the south of Lebanon heavily." Hezbollah said its Haifa strike had avoided the city's petrochemical facilities, though an oil refinery was targeted. It warned on its Al-Manar TV station: "Next time, it will not spare anything in Haifa and its surroundings." Israeli officials said the guerillas used Iranian-made Fajr missiles in the Haifa strike, with a longer range and far larger warhead than the relatively small Katyusha rockets they normally fire. But Shaul Mofaz, an Israeli Cabinet minister and former army chief of staff, later toured the Haifa train depot and said the missiles were Syrian-made. Hezbollah rockets also hit the northern Israeli cities of Acco - which has a large Arab population - and Nahariya, and residents of the region were told to head to bomb shelters. Israeli tanks and armored personnel carriers entered northern Gaza late Saturday, Palestinian residents said, approaching a Palestinian town. The Israeli military would not officially confirm the new incursion. At the G-8 conference in St. Petersburg, Russia, President Bush blamed Hezbollah alone for the escalating violence in the Middle East, putting himself at odds with Russian President Vladimir Putin, who said he believed Israel was pursuing wider goals in its military campaign than the return of abducted soldiers. CBS News has learned that an evacuation of Americans from Lebanon will most likely begin next week. The evacuation would be led by the USS Iwo Jima, with Marine helicopters ferrying as many as 8,000 Americans to nearby Cyprus. CBS News correspondent Cynthia Bowers reports on how the fighting has affected Lebanese-Americans in Dearborn, Mich., who have family members in Lebanon. "Everything is escalating so quickly it doesn't give you time to breathe to react to one thing before something else happens," Issam Abbas tells Bowers of the conflict (video). Hezbollah's leader said Friday that his group is ready for "open war" with Israel, and as his words were broadcast, guerrillas attacked an Israeli warship that had been firing missiles into southern Beirut. Sheik Hassan Nasrallah told Israelis, "You wanted an open war, and we are heading for an open war. We are ready for it." The damage in southern Beirut - a teeming Shiite district where Hezbollah's main headquarters complex is located - was colossal after Israel unleashed its worst bombardment yet overnight, before the Haifa strike. A series of 18 explosions rocked the city before sunrise. Al-Manar television, Hezbollah's main voice to the world, was knocked off the air for eight minutes by the pounding. The Jiyeh power plant, on the southern outskirts, was in flames after being hit, cutting electricity to many areas in the capital and south Lebanon. Firefighters pleaded for help from residents after saying they didn't have enough water to put out the blaze. The southern suburbs were repeatedly blasted by Israeli warplanes for most of Saturday, but the early Sunday raids were the heaviest since Israel launched its offensive Wednesday in retaliation to the capture of two Israeli soldiers by Hezbollah guerillas. Thousands of residents of those neighborhoods – by definition supporters of Hezbollah – have moved out, reports CBS News correspondent Elizabeth Palmer. They are taking shelter in schools and other public buildings. But, Palmer reports, not all of them are happy about Hezbollah's actions. "This is impossible, we have sick kids," Zeinab, a young mother carrying her child, complained. "Why don't they just exchange the two soldiers?" Large swaths of the capital were covered in fine white dust from the barrage. Around the Hezbollah compound in the southern district known as Dahiyah - entire blocks were littered with heaps of rubble and twisted metal, and fires raged. Hezbollah denied Israeli media reports that its leader, Sheik Hassan Nasrallah, had been wounded in an airstrike Sunday, the Arab and Lebanese media said. Trying to defuse the crisis, Lebanon's Western-backed, anti-Syrian prime minister indicated Saturday night he might send his army to take control of southern Lebanon from Hezbollah guerrillas - a top U.N. demand but also a move that might risk civil war. Choking back tears, Prime Minister Fuad Saniora went on television to plead with the United Nations to broker a cease-fire for his "disaster-stricken nation." Saniora did not elaborate on how his government would work with the United Nations to reassert Lebanese authority over its entire territory. But on Sunday, Lebanon's president, Emile Lahoud , a staunch pro-Syrian and close ally of Hezbollah, vowed that Lebanon "will not surrender" and blasted the United Nations, saying it was procrastinating in intervening to give Israel time to force Lebanon into submission. Reacting to Saniora's statements, Israel's Vice Premier Shimon Peres said Lebanon must prove it was serious by deploying troops on the border. The United States and United Nations have long demanded the Lebanese government deploy the army in the south, which Hezbollah guerrillas effectively control. But any effort by Saniora's Sunni Muslim-led government to use force against the Shiite Muslim Hezbollah guerrillas could trigger another bloody civil war in Lebanon. Many fear the 70,000-strong army itself might break up along sectarian lines, as it did during the 1975-90 civil war. In Cairo, Egypt, foreign ministers of 18 Arab countries also asked for U.N. help. The Arab League passed a unanimous resolution calling on the U.N. Security Council to intervene to stop the escalating crisis in the region. "The Middle East peace process has failed. The whole process should now be sent back to the Security Council for a complete overhaul," said Arab League Secretary-General Amr Moussa. "If the Security Council fails, nobody knows what might happen next," he added, pronouncing the whole Mideast peace process "dead."